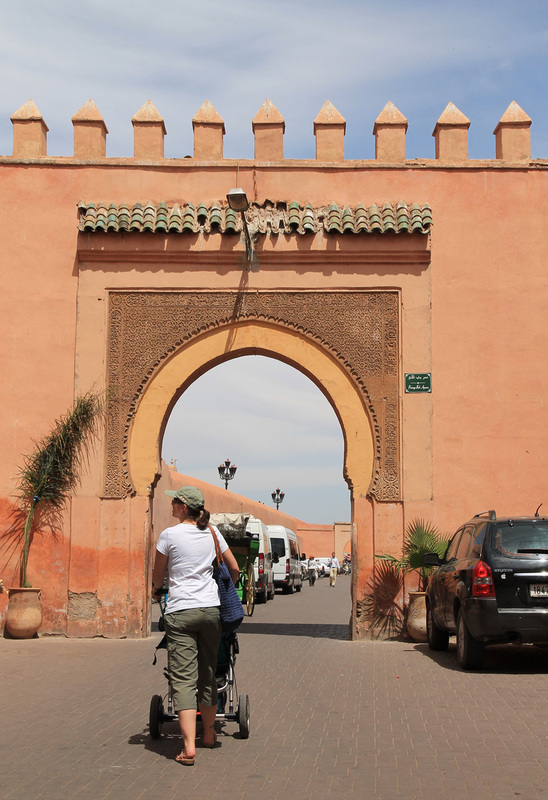 Marrakesh is a welcoming city with hospitable inhabitants and a definite focus on gate and door architecture. This became obvious to us even after a few hours in the city, and although we didn’t plan to write a separate blog post about this subject, we just had to photograph them because of their intricate beauty. 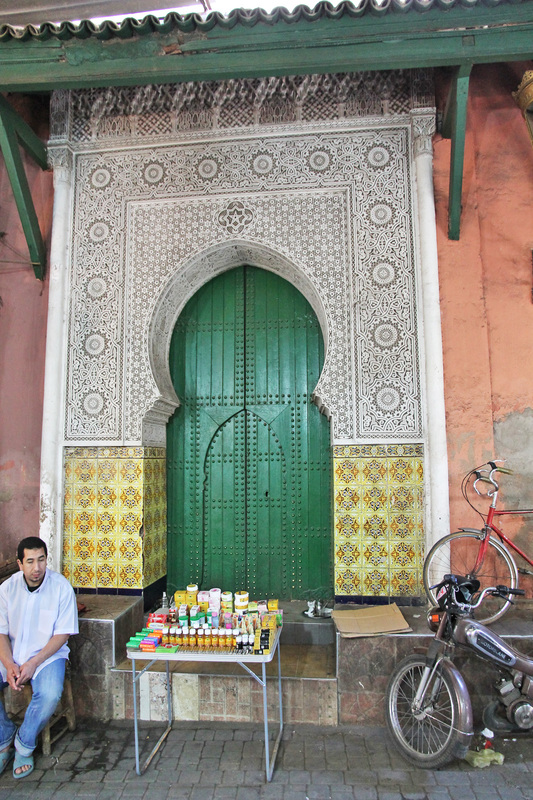 And so this post only focuses on doors and gates in the Marrakesh medina. 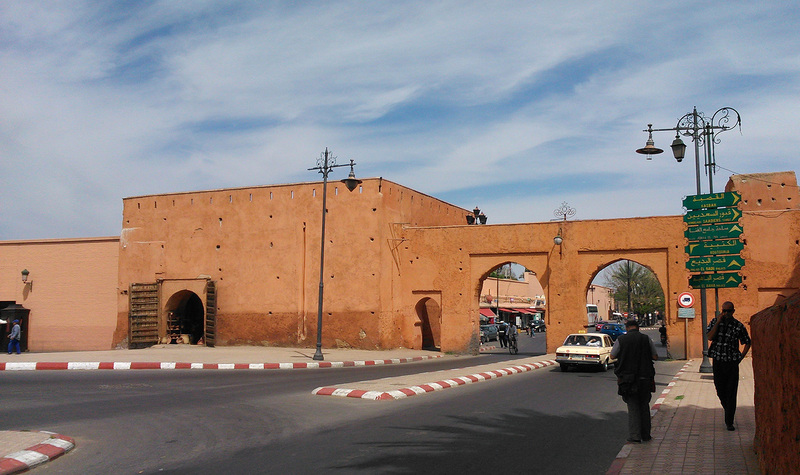 The medina of Marrakesh is completely walled. The ramparts are 19km long and interrupted by 19 gates only. Both the walls and the gates date back to the 12th century. 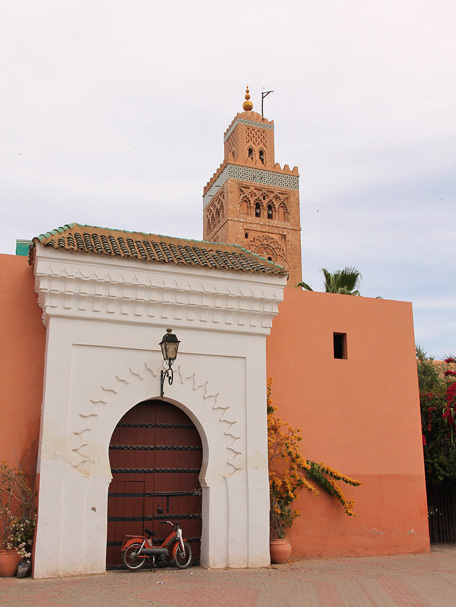 The most beautiful gate is the Bab Agnaou, a triumphal gateway to the royal kasbah, decorated with inscriptions from the Quran. Bab Agnaou. Note the storks. Bab Agnaou and city cabs. 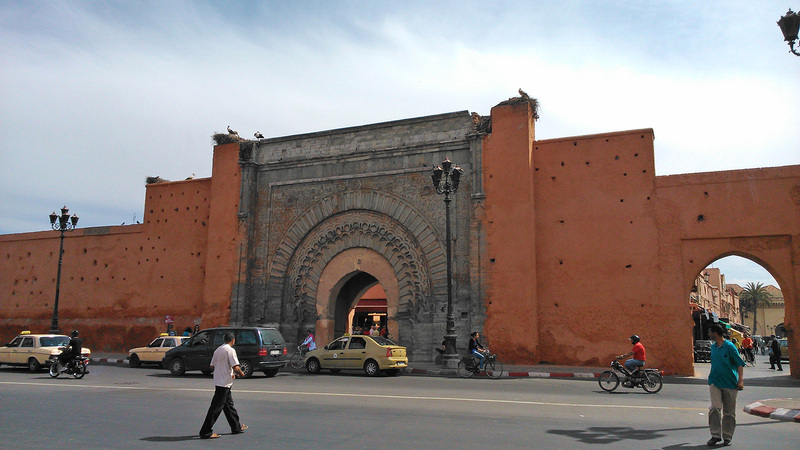 Close to Bab Agnaou is Bab er Robb, consisting of 2 gates. 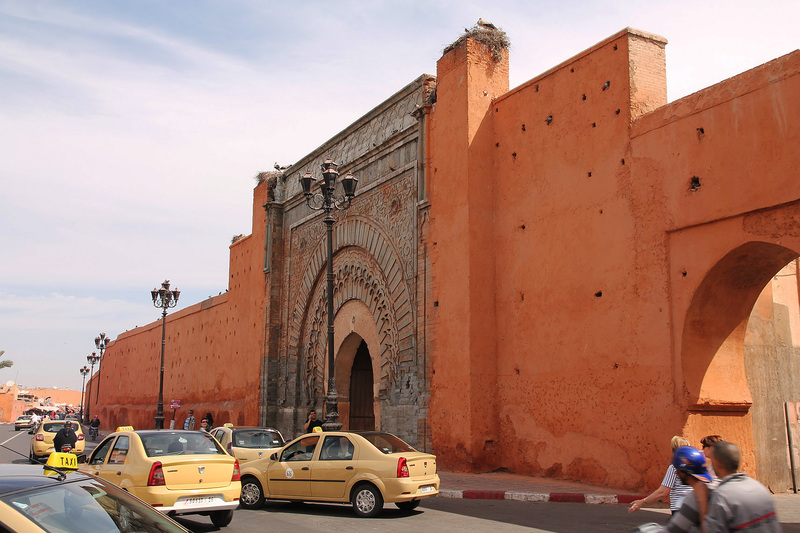 Although originally the official entrance to the city, it is not decorated and consists only of orange-red clay and chalk, the main building materials for all of Marrakesh’s ramparts and gates. Bab er Raha (?) seen from inside the medina. 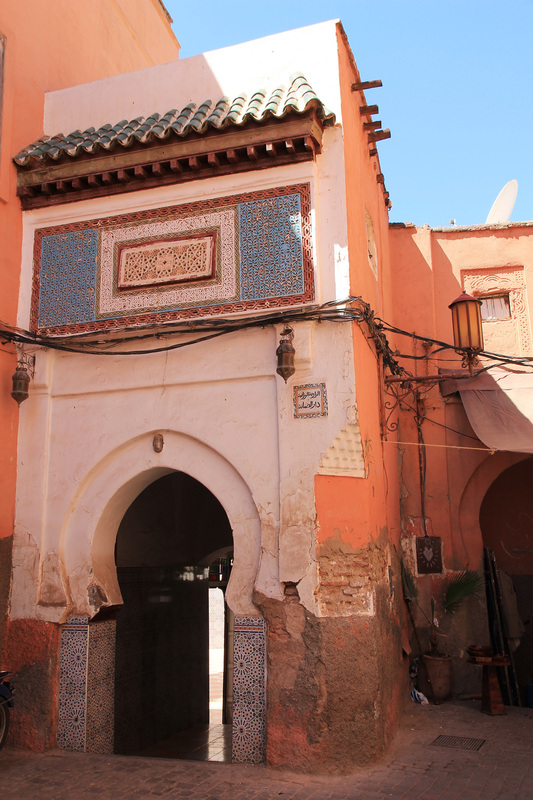 Within the city’s medina, you’ll also find numerous smaller gates and passages, whether or not decorated at all. The one below is situated in the passage Bab Agnaou, a street close to the large Agnaou gate. 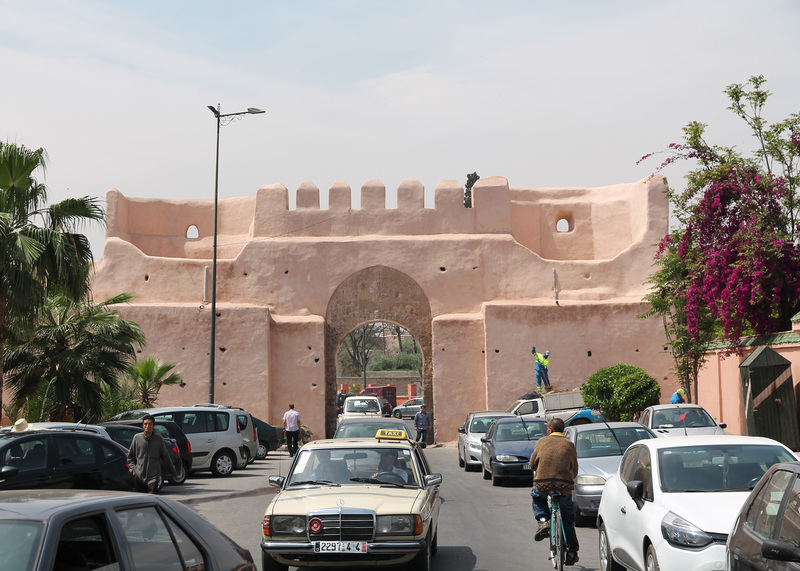 Gate at passage Bab Agnaou. 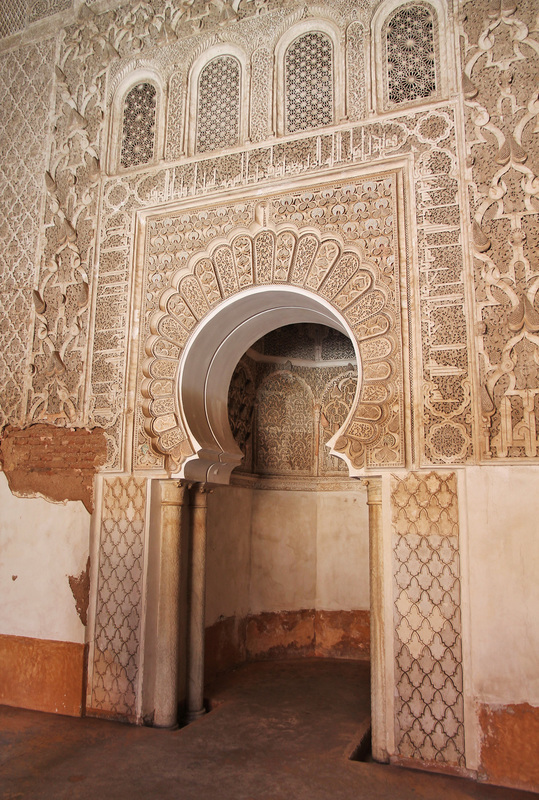 Marrakesh has a lot of highlights, including the Koutoubia mosque, the El Badi Palace and the Ben Youssef Madrasa (Islamic college). As they were places of great importance, a lot of time and effort was spent to embellish them, e.g. with the most beautiful of doors. Door/gate close to the Koutoubia Mosque. 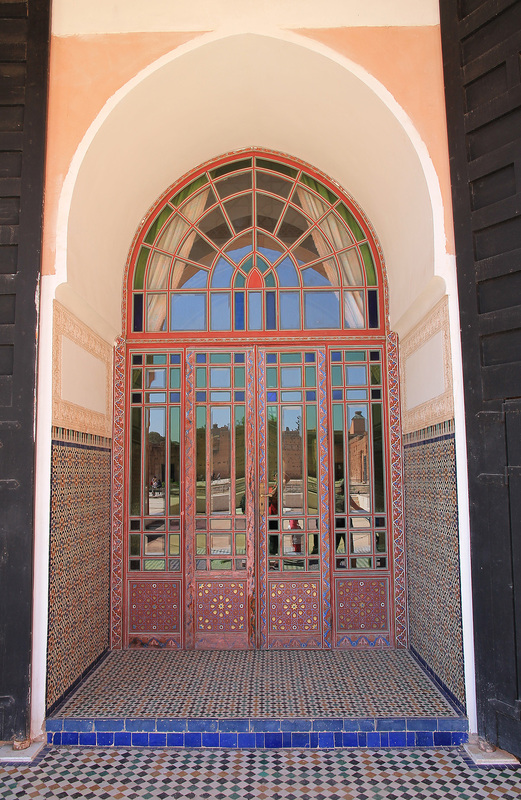 Glass door at the El Badi palace. 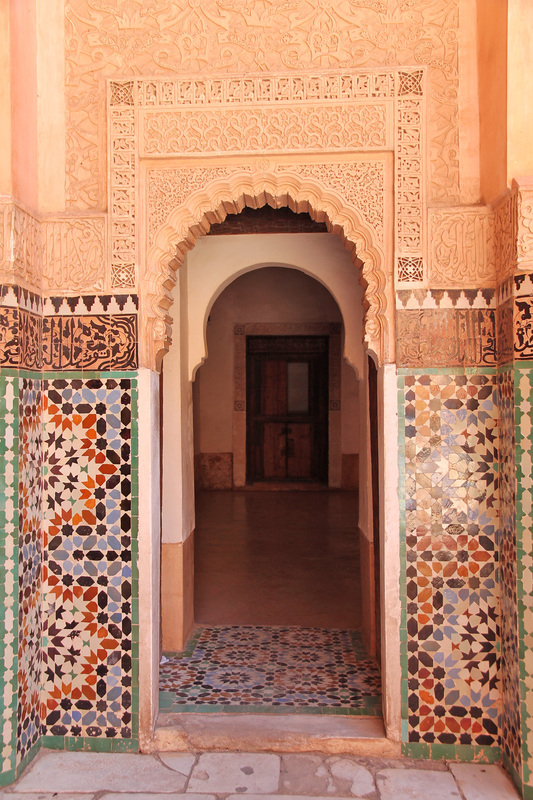 Entering the madrasa Ben Youssef from the central courtyard. 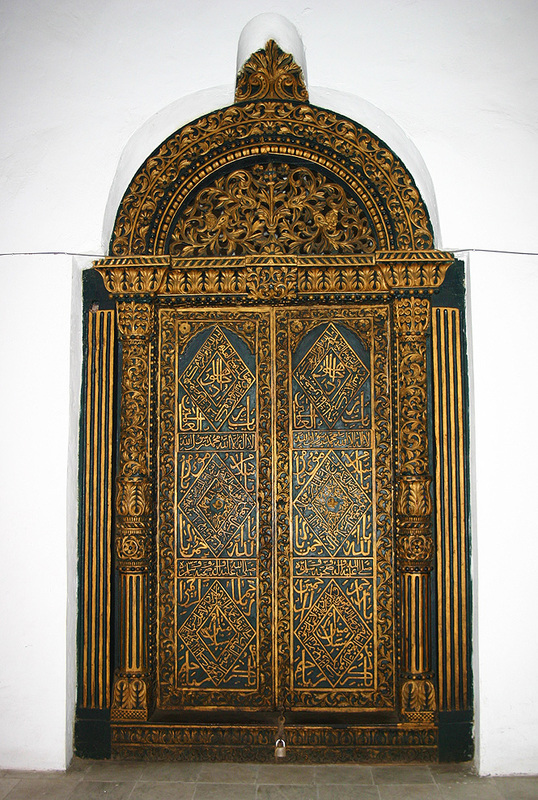 Delicately decorated internal door at the Ben Youssef madrasa. 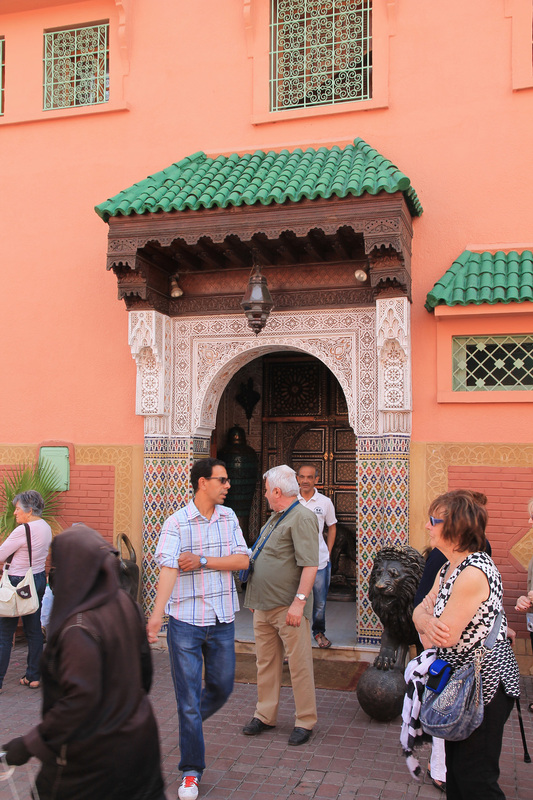 Nevertheless, even outside of the highlights, people take pride in a beautiful entrance for their houses (or riads). We found many examples within the souks. 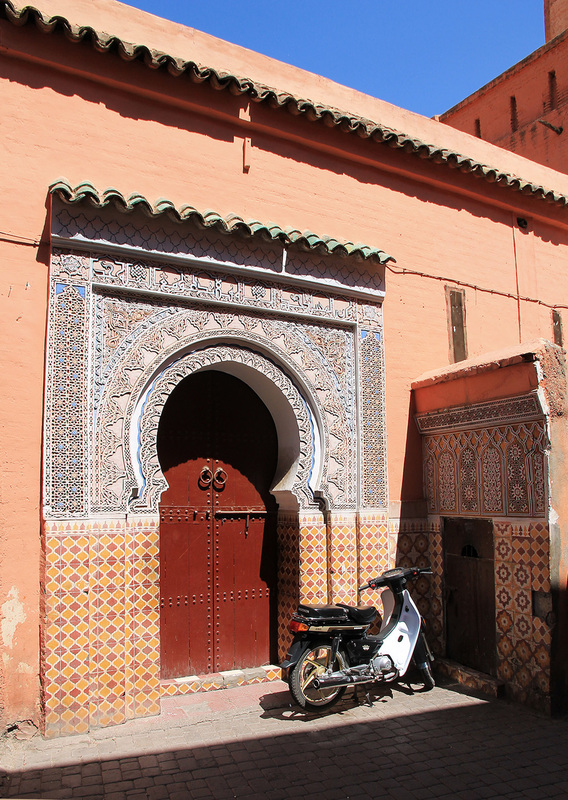 Pretty door @ Marrakesh Souk. 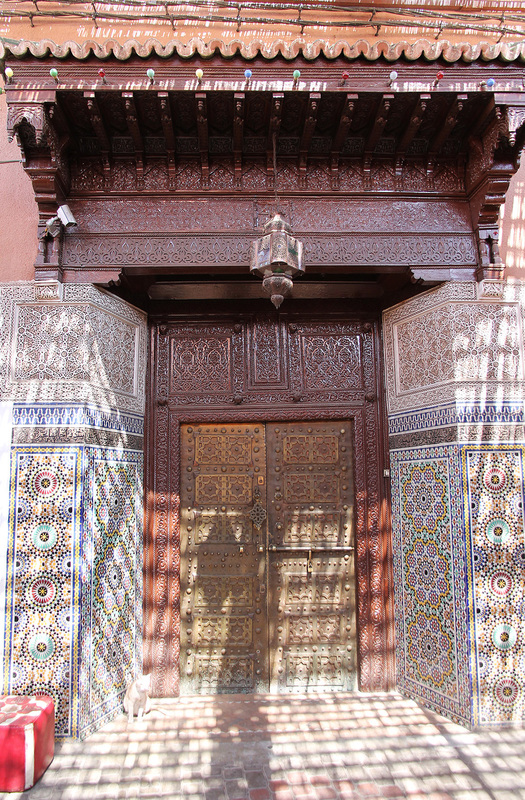 Pretty door @ Marrakesh Souk – part 2. 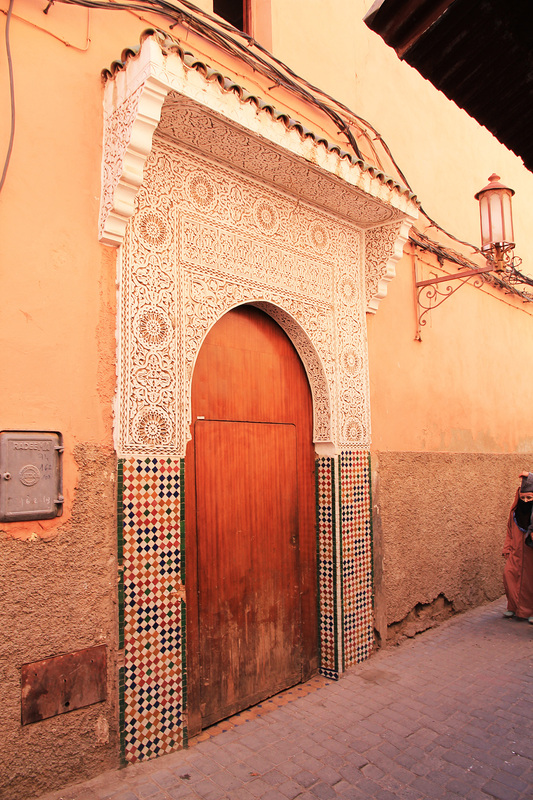 Pretty door @ Marrakesh Souk – part 3. 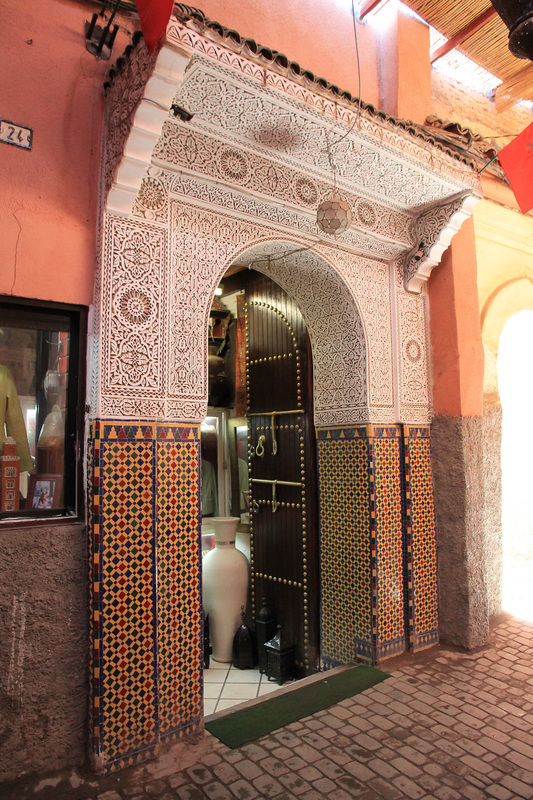 Pretty door @ Marrakesh Souk – part 4. Door in the sun @ Rue Riad Zitoun el Kdim. Note that a lot of these doors have narrow roofs above them, covered with green tiles. Shop entrance in the passage Bab Agnaou. Seeing all those beautiful doors did bring back memories from Stone Town in Zanzibar (Tanzania), where they might have been even more spectacular… The only door picture I have from that trip though (I was a fool in those days, taking only few pictures…) is from one in a museum. 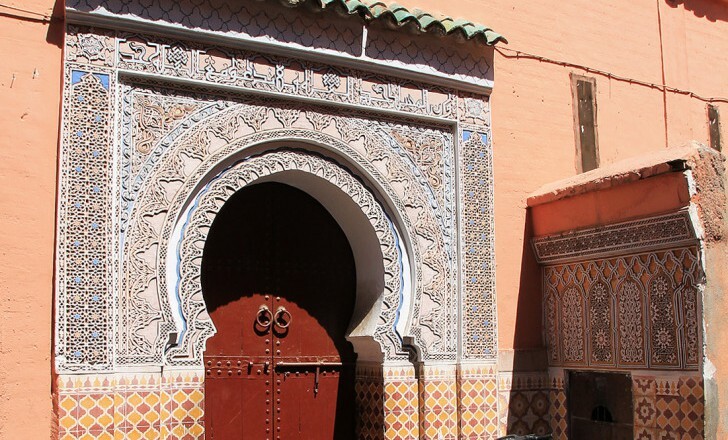 So if we could give you one tip when visiting Marrakesh: pay attention to its doors and gates!